Size of Male: 20-35 lbs., 12.5-13.5 in. Size of Female: 20-35 lbs., 11.5-12.5 in. The Swedish Vallhund is known as the “Viking Dog” since these dogs date back to the days of the Vikings. The breed is more than 1000 years old and is native to Sweden, where they have always been used as farm dogs to herd cattle and sheep. Energetic and intelligent, these small dogs crave human affection. They are friendly dogs who are eager to please and they make excellent family companions. The Swedish Vallhund is a very old spitz breed, dating back over a thousand years. They were favored by the Vikings in the 8th and 9th century. There are notable similarities between this dog breed and the Corgi breeds of Wales, a country which was attacked by Viking raiders in those centuries, so it’s possible that the Valhund was taken to Wales or Corgis were brought to Sweden at that time. Vallhunds, which means “herding dogs,” have always been used to herd sheep and cattle in Sweden. They have also been used as ratters to kill vermin. The breed was almost extinct in 1942 when efforts were undertaken to save the breed. These efforts were successful and today the Swedish Vallhund has been recognized by most of the larger kennel club registries around the world. They were accepted for registration by the American Kennel Club in 2007. Sometimes known as the Swedish Cattle Dog, this breed is a very versatile little dog who makes a fine family companion. They are very intelligent dogs, energetic, fearless, alert, friendly and eager to please. These dogs are said to love human attention and they are very devoted to their families. They are self-confident, lively, curious, brave, loyal and independent. They can be clownish at times in order to get attention and make people laugh. The breed can be very playful. The Vallhund is one of the breeds that is a big dog in a small dog body. They are always even-tempered. They may be reserved with strangers and should be well-socialized at a young age so they won’t be over-protective. As versatile farm dogs they have an instinct to protect the home, even at their small size. They may also have the instinct to herd people or other pets at times, and nip heels, but you can stop this behavior. Otherwise, the Vallhund usually gets along well with other dogs and pets in the home. Loving and sweet in the home, these dogs love children. They can be barkers but this can usually be stopped with training. Living Environment – The Swedish Vallhund adapts very well to living in an apartment. They are small dogs but they are very active, so you will need to provide plenty of exercise. As a farm dog, this breed prefers to have a yard of his own to patrol and exercise in. Grooming – Grooming for this dog breed is fairly easy. These dogs are a “ready-to-go” dog. Brush him weekly (daily when he’s shedding) and bathe as necessary. Diet & Exercise – Dietary needs are considered normal for this breed. They can be prone to put on some extra weight, so measure their food portions carefully. These dogs are very active dogs and they need lots of exercise. Daily walks are encouraged. They will also enjoy a good run off-leash in a safe, enclosed area. Health – Health wise, this is mainly a healthy breed from a genetics standpoint. However, some health issues may occur infrequently, such as canine hip dysplasia, luxating patellas (slipped kneecaps), cleft palate, retinal dysplasia, cryptorchidism, missing teeth and bad bites. If you are interested in this breed you should talk to a breeder about dog health problems. 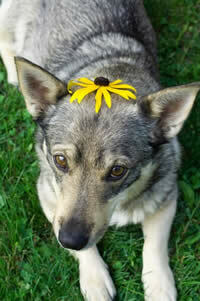 The Swedish Vallhund is a very intelligent little dog and they are eager to learn. They have a strong desire to please their owners which makes dog training relatively easy. They are considered to be problem-solvers and independent thinkers so you will need to make their training challenging and interesting. They won’t enjoy training as much if it is simply boring and repetitive. Be creative and make training fun. The more like a game you make training, the more your dog will like it. Use positive dog training methods (praise, reward) and your dog should learn quickly.